I was listening to an associate the other day and it was a monologue of some good wisdom, some trite anecdotes and quite a lot of overconfidence. He is a lovely bloke, very sincere and well meaning, but he puts people off with his monologues – steady and interminable. The problem is everybody thinks the same as me, but he seems unaware of it and nobody has the heart to tell him that he gets boring. He is quite eloquent at times and so people at first really do listen, but once they get to know him, they begin to switch off and look away. He then gets more desperate for their attention and becomes even more voluble, revving up the message. It gets worse when he is under stress. Do we all have personality traits that we are unaware of (or don’t want to acknowledge) that irritate people around us? I believe most of us do and I can think of one right now for me. My brother let me know of it recently and good for him – and me. I am going to be mindful of that one a bit more and pay more attention to it. We all need to hear such things – often that is exactly what family and friends are for. Strangers rarely let us know. Stress is the factor that can often blind us to the strong and weak sides of our personalities. So if you are going on about your life or philosophy and people are looking away and fidgeting then take note. 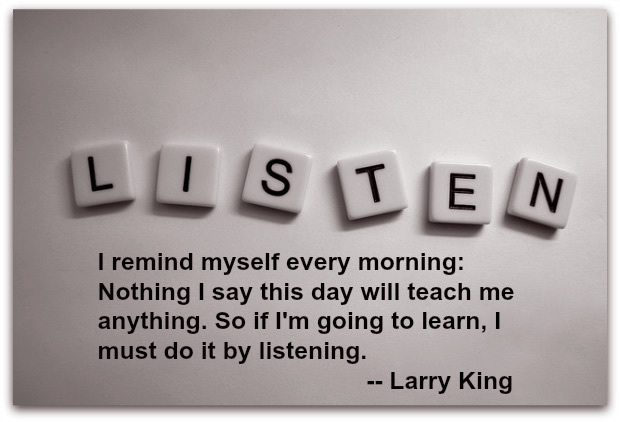 And practice listening to others – especially people close to your heart. Maybe there’s something useful there for you to ponder.